Uses: 16 Watt LED Array. Dimmable when used with special low wattage light dimmers. Not dimmable with EcoMotor fans like CF788 Carrera Grande Eco and CF921 Avant Eco. 61 In Stock! Ships in 2 to 3 Business Days (direct from manufacturer). Shown in Picture: Emerson Sea Breeze Wet Location Ceiling Fan Model CF654ORB in Oil Rubbed Bronze with ABS Outdoor All Weather Oil Rubbed Bronze blades. You can order this fan without a light or choose from various light fixture options to change the look of the fan. The Sea Breeze Wet Location is a Traditional style Ceiling Fan Designed for use indoors or outdoors in dry, damp or wet locations. This fan features a 188mm x 12mm Motor with a 14 Degree Blade Pitch producing an AirFlow rating of 4 (where 5 is best). It is operated by a 3 Speed Pull Chain. Energy Star Qualified for Greater Efficiency. Emerson also features an outdoor fan that is U.L. listed for wet locations. Suitable for outdoor gazebos or any area exposed to the elements, this fan stands up in an conditions. Included Control: 3 Speed Pull Chain. Included Downrod Length(s): 3 1/2"
UL Listed for Wet Applications: The Emerson Sea Breeze Wet Location is UL Listed for Outdoor Wet Locations, which means that you can install it outdoors in uncovered or partially covered areas where it will be directly exposed to rain. Great for a gazebo, lanais, lattice covered patio or any other outdoor area. As with all outdoor ceiling fans, you can also install them indoors in any room that you desire. Minimum Ceiling Height Requirement: Building codes require residential ceiling fans to be installed with the blades at least 7 feet from the floor. In order to meet this requirement, this fan requires a minimum ceiling height of at least 96". If your ceiling is lower than 96" then you may need to add a flushmount adapter or close to ceiling downrod if one is available for the fan (see below). Any light fixture you choose to add to this fan is allowed to be less than 7 feet from the floor, so just make sure you have enough headroom to walk under it if need be. If you cannot find what you need to make this fan work in your room, please give us a call 1-800-201-1193 so we can check to see if there are any further alternatives. The downrod included with the Emerson Sea Breeze Wet Location ceiling fan is 3.5", which puts the blades 12" from the ceiling. Here are the Minimum Ceiling Heights required for each downrod available for this fan. Each length will put the fan blades 7 feet from the floor, so if you want your fan blades higher than 7 feet, choose a shorter downrod to fit your needs. This fan will hange from flat ceilings and ceilings angled up to 26 degrees using the hardware that comes in the box. If your ceiling is over 26 degrees, you can by an Angled Ceiling Adapter that will allow you to install the fan on a ceiling angled up to 45. How does the Emerson Sea Breeze Wet Location Compare to the Average Ceiling Fan? A Quality Rating of 4 is above average, the Emerson Sea Breeze Wet Location ceiling fan will run smooth and quiet and will give you many years of operation with no worries of the motor burning out. A Wind Speed Factor of 3.76 MPH gives this fan a Breeze Rating of 5 out of 5. 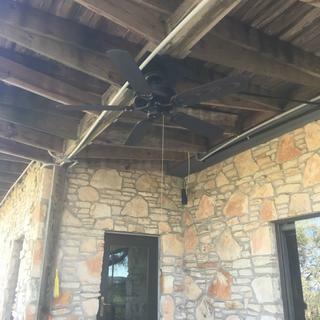 This is a stronger breeze than most ceiling fans, so if you are looking for a fan to keep you cool, the Sea Breeze Wet Location great choice. Aside from Quality, which accounts for smooth quiet operation and durability, the amount of wind-chill a fan can provide to cool you off is the most important consideration. 6492 CFM is a good amount of airflow and is above average. We highly recommend ceiling fans that move at least this amount of air in order to provide enough wind chill effect to keep you cool. The Emerson Sea Breeze Wet Location will allow you to raise your thermostat by several degrees, which will help you save additional money on your cooling bills (if you have AC). 72 Watts per hour is pretty close to average, so it will cost about the same to operate the Emerson Sea Breeze Wet Location as most other ceiling fans. Use the calculator below to estimate just how much it will cost to operate this fan in "Your home". Basic Help: Our operational cost calculator estimates how much it will cost to operate the Emerson Sea Breeze Wet Location ceiling fan. By default, the calculator assumes that you will leave your fan running 24 hours a day for the entire year (which is not very likely to be accurate), so you will want to change the hours and days to be more in line with how often you think you will use the fan. The calculator also defaults to the average cost per kWh of electricity in the USA. You can change this to use the average cost of electricity in your state, although this may vary widely from city to city. For the most accurate calculation, manually enter the actual cost/kWh shown on your utility bill. The wattage of the fan is already included (if it is known), but you can change it if you wish to see how the wattage affects the cost. Is there a way to add remote control to this fan? Yes, you can add a remote control to the fan. We have added a button that allows you to select various controls. Choose the model SR400 for the remote control. Keep in mind that the remote controls themselves are not rated for wet locations, so you need to make sure the control is kept in a covered area. If you have any issues selecting the control, please feel free to give us a call at: 1-800-201-1193 and we will make sure you get everything you need. One last question: How do I decide how many fans I need? Well, you can post the details of your space here and I will respond. But the best and most efficient way is to call and talk to one of our fan experts during our business hours. Again, the number to call is: 1-800-201-1193. Can this be installed without a rod? The Emerson Sea Breeze cannot be installed without the downrod. Keep in mind that when a fan like this is installed without a downrod (if that option is provided), will generally move about 30 percent less air than if they are mounted with a short downrod. This is because the airflow becomes restricted between the ceiling and the blades and does not flow freely. There needs to be at least 12" from the ceiling to the blades for the air to flow freely. Hugger fans that mount flush to the ceiling will always move less air than an equal fan that hangs 12" or more down. So unless the ceiling where you plan to mount the fan is less than 8 feet high, we highly recommend you choose a fan like this one that mounts with a downrod. Locations where there are high winds may be different and a compromise may be necessary if the ceiling is 8 or 9 feet high. Can this fan withstand thunderstorms attached to an open pergola ceiling? There is no testing that I am aware of that would allow me to say how close to a lightening strike a ceiling fan can be without being damaged. I would suggest that a pull chain fan like this would be less susceptible than remote controlled fans with electronics. With that said, the fan is designed to handle direct exposure to rain and snow and is designed to be installed in an open pergola. Perfect for keeping mosquitoes away! Excellent for outdoor wet location - definitely keeps mosquitoes down!